What is the best way to store my RV’s batteries? A question, RVers frequently ask in the fall when planning to store their coaches over the winter, is: What is the best way to store my RV’s batteries? Generally speaking, it is always best to remove them, store them inside on a wood surface and periodically charge the batteries. This avoids the need to have 120 Volt AC power available in the winter storage location. It also makes routine checking and charging of the batteries easier, since, often they are stored at home. If a battery freezes in the RV, it will likely crack, leaking sulphuric acid which will ruin the battery and also damage the floor of the battery compartment. Part of the challenge of removing batteries is re-connecting the battery wiring correctly when reinstalling them. Note: It is important even after removing the batteries, to periodically charge them to ensure they are kept in top condition. More information on this follows. What is the second best alternative? If there is dependable 120 Volt AC available at the storage location, then leaving them in the RV is a possibility. Ensure that the batteries are fully charged (and in good condition), with the fluid at the proper level and all connections clean and tight. Battery disconnects should all be turned off when the RV is not in use and this is especially important during winter storage. Even with the disconnects turned off, there are still a number of things receiving power. Parasitic loads, as these are referred to, include radio & clock memories, engine and transmission computers among other items. 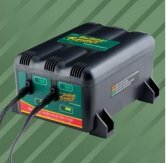 During the RV season the batteries would be able to maintain a suitable charge level if left disconnected for 30 days. This timeframe decreases rapidly at winter temperatures. Even though you have 120 VAC available, I don’t recommend leaving the converter or inverter/charger powered all winter, in other words just simply plugging in the RV power cord to a suitable power outlet. The reason for this is that any 120 Volt AC item with a memory is also on and drawing power (i.e. TV’s, VCR, DVD’s, Satellite receiver etc.). This is simply a waste of electricity. Another factor is that in some RV’s with the Battery Disconnects turned off, the charging current does not reach the battery. Some may choose to leave the batteries connected, and plugged in. That is a possibility, however how well this works depends upon the control system that operates the charger. 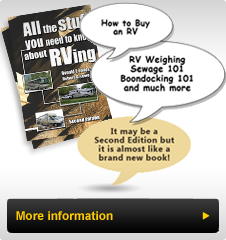 Some RVers have discovered the hard way that should a battery begin to fail, it may cause the charging system to feed the power to it, and leave one set of batteries without charging power. These batteries may freeze and this will shorten their life, and require replacement of not only the original defective battery but likely one or more other batteries. All batteries in storage do need to be maintained and I recommend a one or two circuit Battery Tender Battery Maintainer (or similar) such as the one that I have enclosed a photo of. The number of circuits required depends on whether the RV has a "coach" battery system only (i.e. non motorized RVs) or motorized with a 'chassis' battery. These battery maintainers are connected directly to one or both sets of batteries right at the batteries. It is designed to keep fully charged batteries (without excessive loads on them), charged for long periods of lack of use. It is a maintainer not a battery charger. That is, the unit monitors the batteries and it cycles on and off a low current maintenance charge as called for by the 2 sets of batteries with controls to monitor the state of charge of one or both sets of batteries, turning on and off the maintenance power as required. It simply needs a small regular extension cord run into the location where the unit is mounted (close to or in the battery compartment). The lights on the charger/tender tell you what phase it is in and whether the batteries are fully charged or not. I’ve used this system for 2 years and have had many customers use it as well. We all have had fully charged batteries every time the RV is brought out of storage. You can buy them on the internet for considerable less than the list price. While it can be clipped to the batteries with large included battery connection clips, I recommend the included hard wiring ring connections to each battery system. This eliminates a potential source of trouble. Both alternatives have ends that plug into the wiring from the charger/tender. Hopefully this information is helpful and works for you as well.